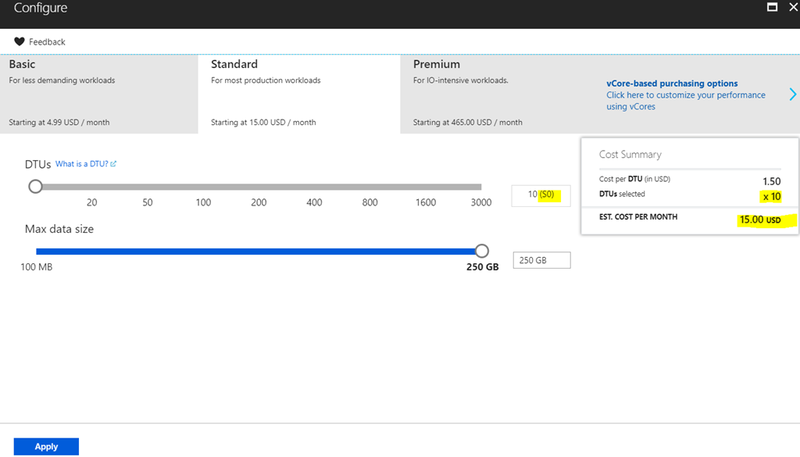 Azure Database – Service Tiers–Performance – Microsoft Azure Articles.. In this Post we can explore the Advantage of SQL Database Tiers Scalability. 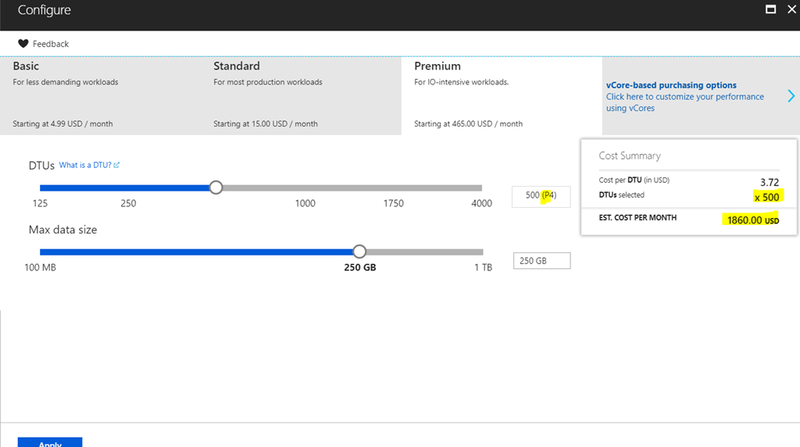 Azure provides Flexibility of Scaling Up/Down based on the Demand. Create an Azure Database with Default Options. You will get it created in Standard service tier. You can create a Table with 10 columns & Insert 10 Lakh Records. It took around 2 hour for me. Now we need to Scale Up and Test. Choose the database Configuration as shown below. In the appearing window choose Premium. Choose the 500 DTU option. Now click Apply button. Wait for Few minutes for the Upgrade to complete. DTU represents Data Throughput Unit. More the DTU More the Performance. Now run the same Query again. The performance got improved by 50% by completing in 1 hour. Increasing the Service Tier / DTU will give quick jump up in performance during Peak hours. Do not forget to scale down after the purpose. Else the bills will also perform huge. Good information. We can quickly understand Importance of DTUs with this post. Thanks Ravi! Your Blog is nice too.